The bootlid and rear lights give it the familiar look of the X and S-Types, but the slim C-pillars echo the lines of the original 1968 XJ6, with a rounded screen, arched quarter-lights and a delicate curve to the roof. The front of the car also takes its styling character from some of the firm's past models. The curves in the bonnet trace the upper line of the headlamps, and there's the famous XJ grille. Under the traditional exterior lurks some innovative technology. 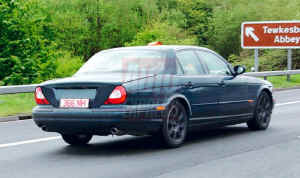 The car will be fitted with the latest development of Jaguar's CATS computer-aided suspension, which adapts to the driver's style and the road conditions. 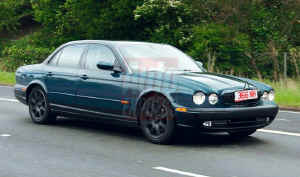 A new aluminium body will make it lighter and faster than the outgoing XJ8. The car will be shown at the Paris Motor Show in September and will be fitted with the current model's 3.2 and 4.0-litre engines, together with the 4.2-litre from the S-Type R. A diesel is also planned, while Ford's Premier Auto Group is said to be developing an aluminium V12, to be shared with the Range Rover. A 4WD version may appear, too.